We realize that you are probably going crazy with the chaotic whirlwind of details to take care of, between booking venues and entertainment, selecting floral arrangements and catering services, etc., it will most assuredly be challenging, but it has its just reward in the end.. At some point in the process you may come to the conclusion that you will need to hire a bartender or waitstaff package, perhaps the reception hall you have booked or the catering service you have hired does not offer a bartender or wait staff as part of the package. For whatever reason you will need to hunt down a mobile bartender or waitstaff, Atlanta has plenty of options available at your disposal. Every aspect of your wedding will be a challenge. As long as you follow our helpful guide below, you should have no issue finding the right service for you. The best place to start any vendor search is by asking the people in your inner circle if they have any recommendations. You need to find out if your wedding reception venue offers an in-house bartending and wait staff service. Ask the venue coordinator for their recommendations. It is also a good idea to go on the internet and cross reference any candidates. Once you have a reasonably sized list of candidates, call each one up, and ask them about their availability. You will only want to schedule appointments with candidates that are not booked on the day of your wedding. Now that you have your appointments set, it will be important to bring plenty of questions and the vision of your wedding to the interview to share with each candidate. Find out from each candidate how experienced they are, and if they work primarily weddings. Ask them on average how many weddings do they service in a year. Depending on what you need, you may be talking with a single bartender, or a manager of a mobile waitstaff service. Discuss with them what you will need for the day, and ask them logistical questions. You want to work with a professional service that is capable of servicing your wedding, which is why the emphasis should be put on finding a service that works weddings. Before the conclusion of each appointment, make sure that you understand what the candidate will provide and how much their service is going to cost you. Take some time to deliberate over which service will be better for you and your specific wedding needs. Trust your instincts, and you should have no problem deciding on who the right candidate is. Once you are ready to choose the candidate you want to service your reception, ask for a written contract and if they demand a deposit. On the day of your wedding, the bartending and/or waitstaff logistics will be handled by the exemplary professional service you have hired to do the job. You can now rest assured that this burden of an aspect has been handled! Are you planning an event or party? Do you need a bartender for your festivities? We do full hospitality staffing including brand ambassadors, valet, security, banquet and cocktail servers. While the wedding season is going strong, corporate functions and fundraisers are starting up. Mobile Cocktails ATL is ready to serve you. • Bartending Staffing for any size event. We hire personality people. 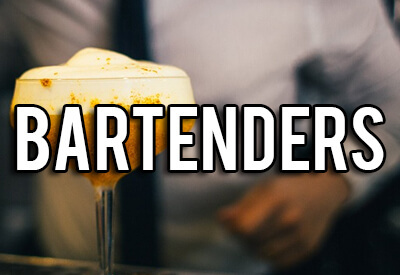 We employ over 50 of the top bartenders in Atlanta - some have been featured in GQ Magazine! • Worry-free Service. We are one of the few staffing services who offer liquor liability insurance, in addition to worker's compensation and general liability insurance. • Custom Cocktails. Would you like a specialty drink to go with your theme, decor or cuisine? Our mixologist experts will craft something special for you. • Flexible Service. We can provide just the staff you need, or we can bring the supplies too! You need bar and glassware rental? No problem! • Planning Consultation. Not sure how much to buy? Which wine will pair with your menu? Which cocktails are trending now? We can help you with that!